So, Pokemon Go was a big hit. The world of AR is out there and really taking off. With the new Jurassic World movie coming out it's time to capitalize on 2 trends. And so, Jurassic World Alive is now out for play. Dean and I went on a bit of a walk so it was the perfect time to try it out. So, don't mind the noise of the cars driving around on the street. The idea here is that ... and I'm really going to draw a lot off of Pokemon Go here, so hopefully you've tried that out ... you walk around the streets and 'dinosaurs' just show up randomly. Kind of the way Pokmenon do in Pokemon Go do. The big difference here is that you don't 'catch' the dinosaur, you are trying to nab enough of its DNA so you can make your own. You nab the DNA by launching a drone to go out and fly over the dinosaur. So it doesn't have to be RIGHT NEXT to you. If it's down the block your drone can fly that far, just the battery may not last as long. The further it is away, the less time you have it to nab DNA. Now, how the drone nabs DNA is a neat little twist on the capturing idea. You get a top down view of the dinosaur as it's traipsing through buildings and it gives you a bullseye. You use your finger to move the drone around and it's slippery controls to simulate actually flying, and you release for it to fire off a dart (supposedly, I guess, the dart hits it, extracts some DNA sample and you'll collect it later). You have a time limit (based on battery) to do it. You can pull off several shots or a few really good placed ones. Darts are your 'pokeballs' here. You have to be ... judicious ... with how freely you want to shoot away. To get more darts you have to find 'supply drops'. Now the nice thing here is that the supply drops are more plentiful than Ingress portals or Pokestops are. In some cases very plentiful. Which is good, because the refresh time is 15 minutes (vs. 5 minutes in the Niantic games). Once you have enough DNA of a certain dinosaur you can 'hatch' or create it. You can keep getting more DNA from wild ones in order to be able to enhance / level up the one in your team (why you can't just get DNA samples from that one I don't understand). 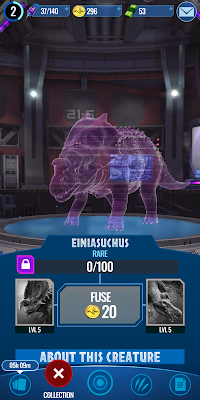 Apparently at higher levels of the dinos you can 'hybridize' (to play up on the theme of the movies) and make your own styles. Pretty cool. Haven't got that far myself. There aren't that many supply drops near me, so darts are a rare commodity. Why I can't send a drone out to a supply stop is something of a 'whu?' (there's 4 that are about a block from me... I can get dinos that are that far out easily enough). The other aspect is you can also 'battle' with your dinos against others. This is very much like your Pokemon battles. How it picks 4 of your dinos out of the full list, I'm not sure. It seems random to me. You fight against another dinosaur and it has specific attacks and special attacks and whatnot. The trick here is to get 3 'wins' before they get 3 'wins' (wins = knocking out a dino). 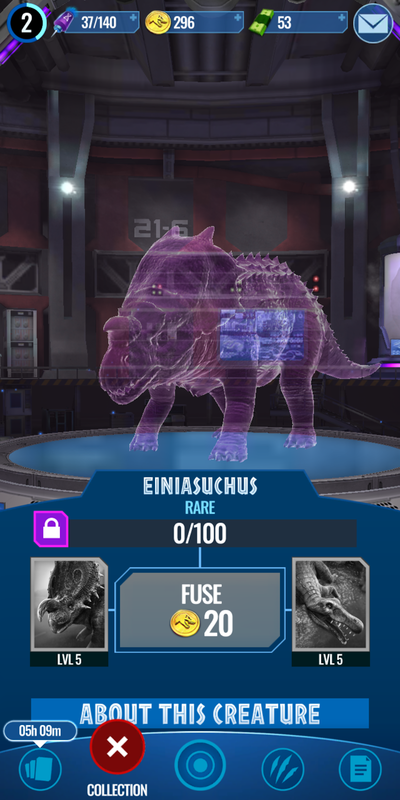 It's a real strategic thing because there's the idea of which dino is faster as it gets to attack first, and if you swap out your dino who's getting the beat down the other dino gets a free attack. It's tough for me to properly wrap my head around. Then there's 'incubators' you get where you can get items from ... but they take time. Like most things in the game you can pay to play... pay more coins to speed up the incubator. Pay more coins to get more darts etc... it gets a little tiring, but it's fun. The real trick in the staying power is how readily resources will be to the person that's a casual player. If getting more darts is too hard ... then why play. It's already at that level for me. Because, here's the real issue I've found. In the other Niantic games there was a 'walking bonus'. The real reason to get out of your chair and walk the neighbourhood was to nab XM and there were medals, in Pokemon Go you would get candies or hatch eggs. With this game there's nothing. The only reason to want to walk down the block is because there's a supply drop there, which could be enough ... but maybe not. Anyways, we'll see what the future holds.